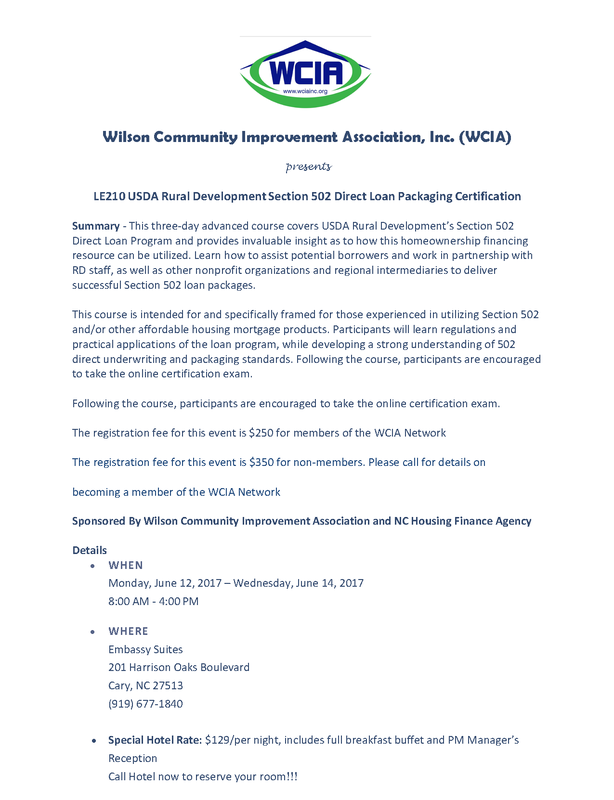 Rural Home Loans (USDA) – Wilson Community Improvement Association, Inc.
Is your organization a 501C3 non-profit, State Housing Finance Agency or Tribal Housing Authority and interested in packaging 502 Direct Loans? If so contact Barbara Blackston at blackston@wciainc.org for more information. uniform-residential-loan-application-rd410-4. Submit form using the Contact Us page. A number of factors are considered when determining an applicant’s eligibility for Single Family Direct Home Loans. At a minimum, applicants interested in obtaining a direct loan must have an adjusted income that is at or below 80% of the County Area Median Income for the area where they wish to buy a house and they must demonstrate a willingness and ability to repay debt. applicant’s ability to repay a loan considers various factors such as income, debts, assets and the amount of payment assistance applicants may be eligible to receive. Regardless of repayment ability, applicants may never borrow more than the area’s loan limit (plus certain costs allowed to be financed) for the county in which the property is located. Fixed interest rate based on current market rates at loan approval or loan closing, whichever is lower. Interest rate when modified by payment assistance can be as low as 1%. use a portion of those assets. Applications for this program are accepted through a qualified nonprofit agency year round. Are you ready to get started? Please call 252-243-4855 for an agency in your area. 2nd Annual ART Exhibition is now open Monday - Thursday, 2pm - 4pm, other times by appointment only. Paint and Sip Classes, and Healthy Housing Assessments call 252-243-4855 for more details. *Please download and fill out the form. This form is editable on your computer. When completed, save the file and upload the PDF via the contact us page. Please use the PayPal link to pay for the training.